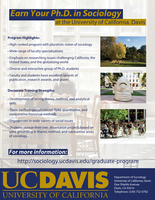 The UC Davis Department of Sociology's Ph.D. program in which students can choose individualized themes. The graduate program emphasizes rigorous preparation in sociological theory and research methodologies as the basis of sound scholarship. Theoretical, methodological, and substantive pluralism characterize faculty research interests and departmental course offerings. Students are encouraged to begin active research early in their graduate careers. An average of 50 to 70 students concurrently enroll in the sociology graduate program, which has 28 faculty faculty members and affiliates. Faculty and students have excellent records of publication, research awards and grants. In addition, students may pursue a designated emphasis in one of the following areas: critical theory; feminist theory; Science and Technology Studies; and African American and African Studies. The department provides students with facilities for study, work and social interaction. Limited office space is available as are individual mailboxes and a computer lab, in addition to extensive campus facilities. Applicants accepted into the sociology graduate program are admitted directly to the Ph.D. program. The master's degree is awarded to students in the course of working toward the Ph.D. degree. Continuation in the Ph.D. program is contingent upon satisfactory completion of all M.A. degree requirements. The larger graduate community at UC Davis values a diversity of viewpoints, backgrounds, and experiences among its students, knowing that a diverse student body strengthens the research, scholarship, and teaching of all members of our community. As a part of our commitment to diversity there are numerous resources, mentoring workshops, events and professional staff members positioned to meet the needs of our graduate students as they achieve their professional, educational, and career goals. Please feel free to contact Dr. Josephine Moreno, UC Davis’ Graduate Diversity Officer for Humanities, Arts, Social Sciences and Education, with any questions or concerns regarding diversity in Graduate Studies. Visit the Office of Graduate Studies' Diversity website to read the latest initiatives. We embrace the UC Davis campuswide Principles of Community.